Concluding our (first) Super Mario marathon, Leon, Darren Gargette and James attempt to resolve the quandary that is the (not so) New Super Mario Bros. series. From 2006 DS debut to 2013’s premium Luigi-themed dlc, we attempt to decipher whether the NSMB games are worthy heirs to the 2D Mario Mushroom Kingdom throne or simply tired rehashes of an aged formula. What gets in the way of greatness for the NSMB games are indeed the somewhat bland graphical style and music and the constant recycling of assets and level themes (with U they at least tried to enhance these in a number of ways). 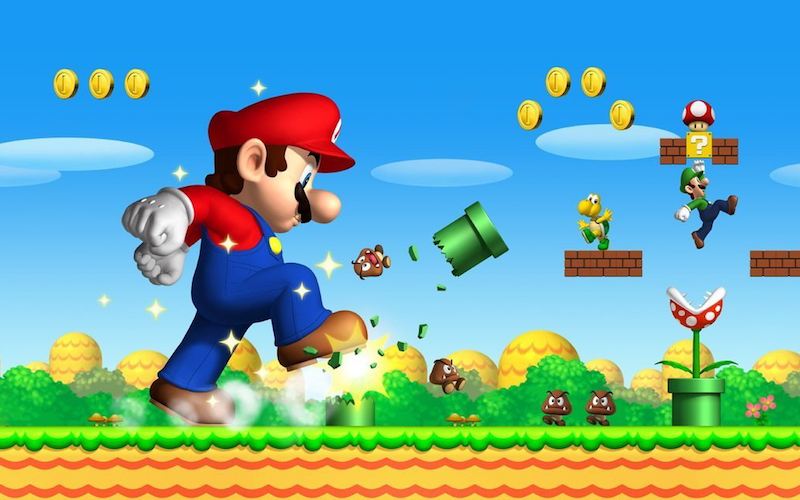 But New Super Mario Bros. Wii and New Super Mario Bros. U are masterclasses in 2D platforming level design. They’re meticulous in that aspect and NSMB Wii quietly started a trend in which almost every stage in a one 2D platform game contains a wholly unique challenge (see Donkey Kong Country returns and Rayman Legends). The DS and 3DS game are unfortunately not up to that standard and I hated the ‘million coins’ gimmickry of the 3DS game and never even bothered with it (also because it marked the 3rd game in this series that used the exact same level assets). The superplay videos you can unlock in New Super Mario Bros. Wii also highlight just how fantastic that game’s level design is. The sky stage has some of the most memorable levels for me, from the bullet hell tower, to the castle with tiny safe spots among the huge moving spiky pillars. I am also of the conviction that in multiplayer these games are best enjoyed if you’re not too serious about making actual progress (though multiplayer provides some exploits that make the game – and the collection of the big coins – easier), unless you’re all really coordinated. I played NSMB Wii with a friend from the U.S. once, when he came over to visit me and we had this rare, strange chemistry where we, without uttering many words, found ourselves on the same wave length and breezed through levels together, boosting each other’s jumps etc.